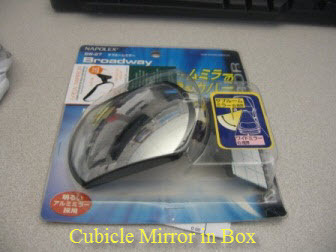 I really wonder why it took me so long to buy a cubicle mirror. 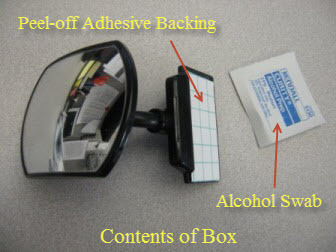 I've been working in cubicles for more than 30 years and never decided to look more into these rather unique and interestingoffice accessories. I've seen them in various offices and cubicles throughout my company for years but never decided to make the purchase – until recently. Boy am I kicking myself for not doing it sooner. I set up my new monitor mirror a couple of days ago and it has really added a lot to my cubicle environment. I made it a point to walk around the cube farm at work and noticed that around 90% of the workers have their computer monitors in the corner of their cubicle and the opening of the cubicle to the hallway is directly behind their back. This is my exact office setup and my cubicle is on one of the high-traffic hallways in my area of the company. In fact, a lot of my co-workers, as they walk by my office, greet me with “Hi Bob“, “Good morning Bob“, “How's it going Bob?” and, before I got my cubicle mirror, I couldn't always make out who they were by their voices. Now, all I have to do is to look in my computer mirror, attached to the left side of my monitor, and I know exactly who is speaking to me. 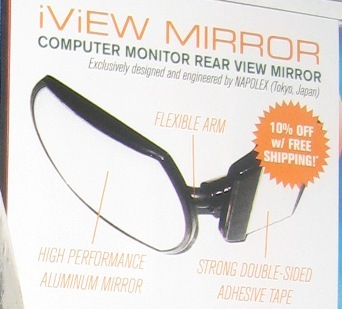 The one I purchased is called the iViEW Rear View Computer Monitor Mirror and it is perfect for my office cubicle. Check out my monitor mirror review with video here! In my line of work as an IT professional, end users are always dropping by to ask me questions about reports or software solutions that I have developed. They tend to knock on my cubicle wall to get my attention and I don't know who it is until I turn around. There is something comforting about knowing who is standing behind me before I actually turn around to address them. Maybe it's my paranoia thinking that someone is sneaking up on me from behind. Well, with my handy-dandy rear mirror, no one can sneak up on me any longer. Also, there are times during the day that I wear ear buds to listen to music or sports talk on internet radio. 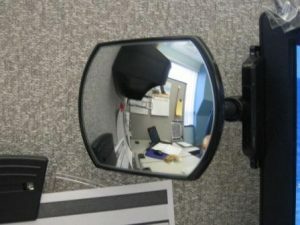 I may not even hear the knocking on my cubicle wall with the ear buds on so the cubicle rear view mirror works perfectly! 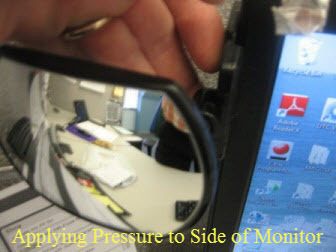 As you can see from the above images, it is a piece of cake to attach the rear view mirror to your flat panel monitor. 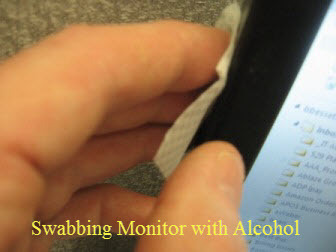 I attached mine to the side of my flat panel monitor which is about 1″ thick but if yours is thinner you can easily just attach it to the back of the monitor since the monitor will swivel at least 180 degrees. You can also note from the last image how easy it is to see the cubicle opening behind me. Now I get no surprises when someone comes a knockin! 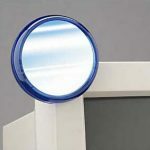 If you've always thought about buying a blind spot mirror for your office cubicle, this one is an excellent model to consider. 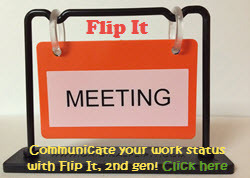 It is a worthwhile office mirror that will keep you aware of your surroundings at all times. And another great thing about a cubicle mirror is that you don't have to worry about cord management in your cubicle. If you'd like to check out some other models, here are three others you can take a look at for your cubicles. Don't forget to check out my monitor mirror review with video here! 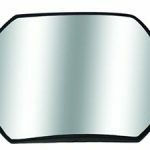 You'll be surprised how adding a cubicle mirror to your office will enhance your working environment. Another reasonable and highly impactful cubicle accessory that you may want to look into is a versatile Fellowes Coat Hook and Clip. Surround yourself with office accessories that make a difference in how you work and you'll never regret making that investment. I even have a co-worker who bought herself a cubicle window so there are certainly many different accessories made for such a small space. I like to make my office like my home so I'm always looking for was to improve my office environment. You too should look for ways to improve your workspace because it certainly will improve your attitude and will probably increase your work productivity. Don't forget, if you have any questions or comments about this item, or any item on this site, please don't hesitate to leave a question in the comments or just get in touch with me using my Contact Me page.